Greenhouse gas emissions produced by fossil fuel combustion, deforestation, agriculture, and other activities have accumulated in the atmosphere for decades and will continue to change the climate for years to come. Bearing this mind, we must adapt and become resilient as well as take action to avoid creating additional emissions in the future. In 2013, City Council passed a resolution to identify the potential environmental, economic, and social impacts to City operations and assets resulting from climate change. 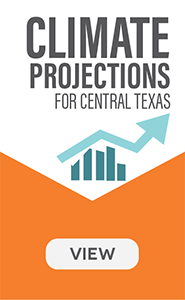 As part of this effort, ATMOS Research, led by Dr. Katherine Hayhoe from Texas Tech University, developed climate change projections through 2100 for Austin. 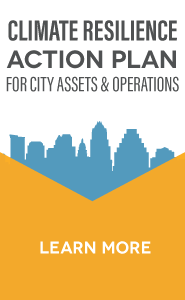 The final report to Council, Toward A Climate Resilient Austin, provides details from this analysis, as well as recommendations for future planning efforts to increase resilience. The Office of Sustainability also worked closely with CAMPO and other state, regional, and local entities to produce The Central Texas Extreme Weather and Climate Change Vulnerability Assessment of Regional Transportation Infrastructure. The infrastructure that was evaluated included roadways, bridges, and rail. The climate-related stressors that were considered as part of the assessment were flooding, drought, extreme heat, wildfire, and extreme cold.